A relative newcomer to the scene, Callum has burst forth with a fresh and ambitious attitude since learning himself to DJ in 2016. Supporting some some of his favourite international DJs and idols including Darius Syrossian and Jackmaster, he has graced the decks at some of the most popular venues in the country. 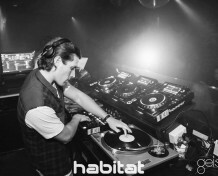 The 2017 Habitat DJ competition victory was a key that unlocked exposure for him, allowing him to unleash his passion to more crowds ever since. Callum’s entire life is infused with music. Dedicating all his spare time either mining the web for obscure gems to bring to the dance floor, or nestled at home getting creative with his record collection. “Music is my life and what I love is introducing diverse audiences to different types of music, educating them and connecting them in a way that nothing else can”. Callum’s ever evolving DJ style is a culmination of his many influences over the past few years deep from the roots of Chicago House, Detroit Techno, Disco, Funk & Boogie. To Callum, it’s all about variety and being versatile for any occasion, thinking of music as energy and emotion and not believing in sub genres and trends. “If I like what I hear, it’s great music regardless of origin and when it was made”. He takes inspiration from something Frankie Knuckles once said in a Defected Records interview: “For me each song that I play has got to be just as great as the last one that was on before it”.